Given the scarcity of suitable venues and festivals at which to show our co-productions, both in Catalonia and the rest of Spain, in 2011 Antic Teatre came up with an internationalisation plan for performance creation based on innovation and new performance languages. This initiative, as well as opening up a new range of potential performance spaces for our co-produced shows, provides for their distribution and sale internationally. (see: on tour). The plan consists primarily of participation in international performing arts networks and the production of two projects, cav_a and B2B; the former a performance arts project, and the latter based on avant-garde music. cav_a: catalan artists visiting ___ artists is a collaboration programme for sharing, understanding and promoting awareness of performance creation practices from Catalonia, and at the same time learning about such practices in the host country. By encouraging international co-operation between independent research centres in the field of multidisciplinary arts, we hope to increase cultural perspectives and spread new forms of creative expression. To date there have been six editions of the cav_a project, held in four different countries (Slovenia, Croatia, France and Greece), with the participation of nine Catalan companies. B2B. 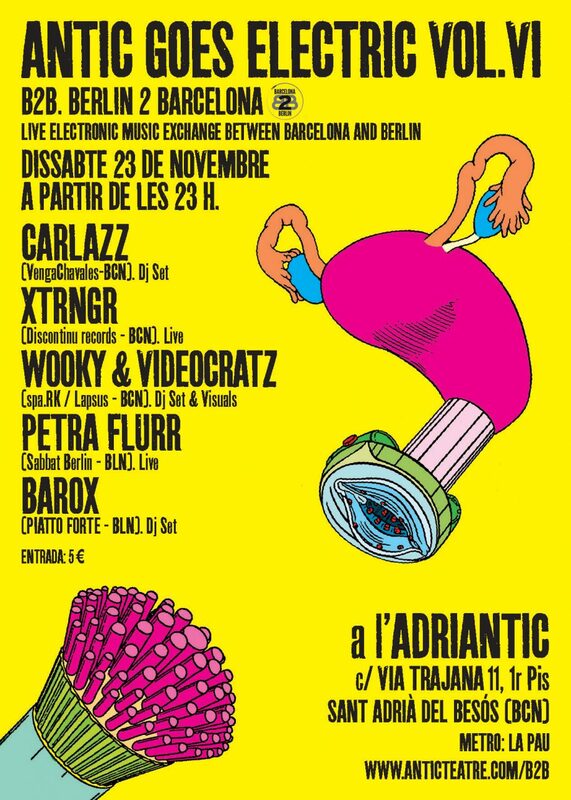 Live electronic music exchange between Barcelona and Berlin. B2B is an international electronica and multimedia arts festival involving artists from Berlin and Barcelona that offers a complete but careful selection of live and DJ sets in experimental music, dance, electro, electro-punk and visual arts. The festival ran for six years between 2008 and 2014. For the first four years it was held in Barcelona with a programme of mainly German international creators, while between 2012 and 2014 there were two editions a year: one in Berlin, featuring Catalan artists, and the other at Antic Teatre with artists from Berlin. The B2B Festival was produced in collaboration with Piatto Forte / Duplikat Records (Berlin, Germany). See all B2B editions: 2014, 2013 Berlin/2013 BCN, 2012 Berlin/2012 BCN, 2011, 2010, 2009, 2008. This is one of the basic pillars of Antic Teatre’s internationalisation plan. Being present in international networks provides the opportunity to acquire new skills and knowledge about cultural realities in other countries, while at the same time encouraging the creation of alliances for the promotion and distribution of Antic Teatre’s productions and co-productions. Antic Teatre is a member of two international networks: IETM (International Network for Contemporary Performing Arts) and TEH (Trans Europe Halles). Antic Teatre has been a member of this network since 2005. The aim is to keep track of developments in international performance arts as well as of cultural policies evolving in other countries. The IETM network allows us to stay informed, share and learn about the different ways of managing culture and working on cultural policy. IETM is an organisation for professionals that exists to stimulate the quality, the development and the context of contemporary performing arts and facilitate the establishment of a network for professional communication, dynamic information exchange, transfer of technical know-how and presentation of good working models. IETM brings together more than 600 professionals representing performing arts organisations from over 45 countries who are committed to contemporary and innovative work and believe in cross-border artistic exchange and collaboration. Antic Teatre has been a member of TEH since the spring of 2012. Trans Europe Halles is a European network of cultural centres established by citizens and artists, at the forefront of the move to recover industrial buildings and spaces and use them for arts, culture and activism since 1983. Its mission is to strengthen the sustainable development of non-governmental cultural centres and encourage new initiatives through contact with, support and promotion of the centres themselves. Its aims are to faciltate international co-operation, providing opportunities for learning and sharing, encouraging the practice and promoting the impact and value of arts and culture. The network currently consists of more than 60 interdisciplinary cultural centres in over 20 countires. The main objective in belonging to such a network is to establish connections with cultural centres and spaces that have a similar philosophy to ours at Antic Teatre. We have reached collaboration agreements for the cav_a project with some of these spaces, while with others we work on obtaining support for the distribution of our productions.